– peg weighting on off-camber can literally save your life, I have a few near death experiences , the off camber was along the lower side of the mountain (single path- lots of pressure) and the drop was into a deep river so if you fell the wrong way ur bike was GONE – swallowed by the river gods!! – I learnt that sometime being pushed outside of your comfort zone is the only way to acknowledge your true capabilities and the capability of these awesome machines!! Overall a great experience – one I will never forget and will DEFINITELY re-visit, now that I know how to prep for it!! That’s a time-tested piece of fire fighting advice that also applies to things like our health, security, and yes—even your dirt bike! Routine dirt bike maintenance can prevent catastrophic mechanical failure, accidents and injuries, and costly repairs. Wash your bike after every ride. Be gentle. We recommend simply using a bucket of water and a selection of brushes to knock off mud. You can use a pressure washer, but be careful to deflect the water away from the bike, so you don’t force water and dirt into areas where it can damage engine or electrical components. Consider using an airbox cover to seal off the carburetor from water and debris. Dry it before you inspect it. Make sure your bike is clean and dry before you inspect it for maintenance issues. You can use a dryer or leaf blower to speed up the drying process. Once your dirt bike is clean and dry, look for oil drips on the ground and underneath the motor. Also, inspect for coolant and brake fluid. Inspect and clean your chain. If your dirt bike’s drive chain is particularly muddy, allow the mud to dry overnight, so it can be more easily removed with a nylon brush. Once the chain is clean, lubricate it with a high-quality chain lube from Klotz, Maxima, Bel-Ray, or other trusted brand. Remember, the chain should never be taut—there should be some slack to compensate for suspension movement. On the other hand, if you are able to remove the chain from the rear sprocket, it has become too loose and should be replaced. No matter how much travel your dirt bike’s suspension has, the ideal amount of chain free-play is ½-inch or 13 millimeters when the swingarm is parallel to the ground. Check your hardware to make sure bolts haven’t loosened under extreme vibration. Check out your controls and control cables. Inspect your throttle and clutch cables and replace them if they are frayed or kinked. Then, test the throttle control for the proper amount of free play. An easy way to test for free play is to place the bike on a work stand, start it up, and let it idle. Then, rotate the handlbars through their full range of travel and listen for any increase in engine rpm. If an increase occurs, you need to add free play to your throttle cable. Also, test your throttle for responsive operation, making sure it snaps back crisply when twisted. Check and clean your air filter. By maintaining a clean air filter, you’ll not only improve performance, you’ll protect your engine from costly damage. You can use a quality spray-on air filter cleaner or clean it with a mix of water and a household cleaner like Simple Green. Once the filter is dry, coat it with high-quality air filter oil. Check your tire pressure in between each ride. Use a tire pressure gauge to set the proper pressure based on the terrain conditions. We recommend 8 psi (front tires) and 6 psi (rear tires) for muddy conditions and 14 psi (front) and 12 psi (rear) for dry conditions. If you spend most of your time in the dirt or mud—or if your dirt bike sees extreme duty—you need to change your motor oil often. Some say change your oil after every ride; others say change the oil every eight to 10 operating hours. Follow your manufacturer’s recommendations, but remember—the more often you change your oil, the longer your engine will likely live. You should replace your brake fluid periodically, because it is inherently conducive to absorbing moisture. Most manufacturers recommend DOT-4 brake fluid—an alcohol-based fluid—for dirt bikes. Also, check your coolant level and top off as needed. Plan to flush and change your cooling system once per year. Grease seals out water and dirt and provides lubrication for important components. Inspect your air filter’s sealing area, swingarm and hardware, wheel bearings and seals, shock seals and forks, and steering head bearings. Use a good PTFE-based, petroleum-based, or moly grease where necessary. 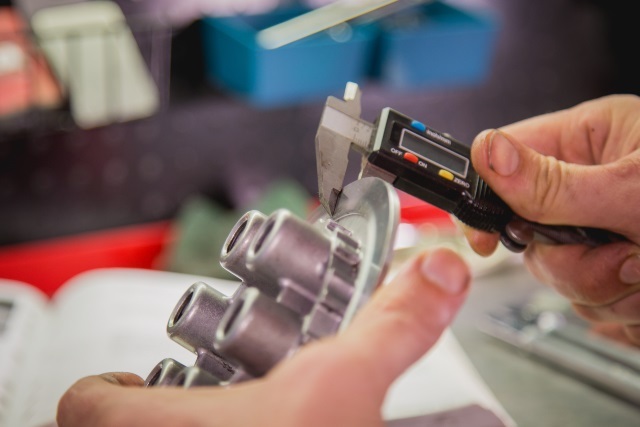 Checking clutch components is generally not part of the pre-ride check nor is it really something addressed when performing routine maintenance. Usually, the first sign of trouble is when the gears slip. 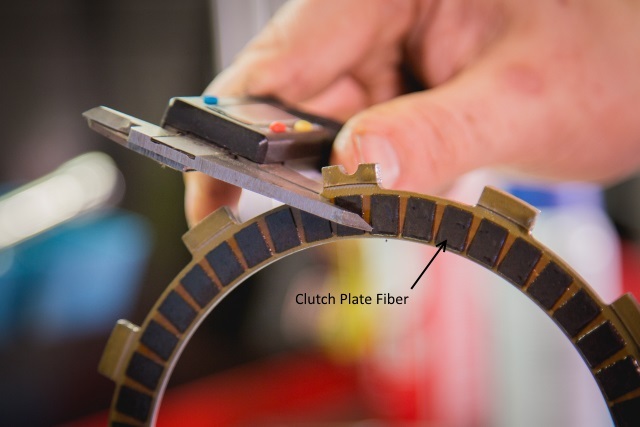 Since most seasoned riders can trouble shoot their way from there, because other issues mimic clutch problems, that’s quite often when the clutch gets changed, if needed. 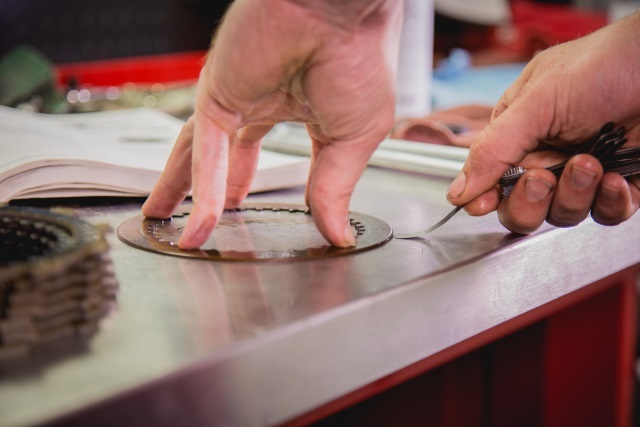 Other issues that affect the gears include worn out chain and sprockets and/or inappropriate slack on the chain, a clutch cable that’s frayed or not adjusted properly, or the clutch lever needs lubrication or adjusting. Once you’ve ruled out these problems, the likely cause is the clutch. The clutch plates and drive plates make up the clutch pack. The clutch plate fiber (looks like cork) lines the surface of the plate. If any components display thickness below recommended limits it’s time to replace the clutch. If the drive plate shows warpage beyond the recommended limits, you’ll also need to replace the above segments. Keep in mind that most clutch kits do not include a cover gasket, pressure plates, the hub and basket together. You’ll have to buy everything separate including the clutch pack. However, a typical clutch replacement changes just the clutch pack consisting of the drive plates and clutch plates, the pressure plate and springs. Therefore similar to the chain and sprockets, replace the clutch pack, springs and pressure plate together. A major clutch overhaul, which includes changing the hub and basket adds a bit more time and effort but isn’t done as often. Visually inspect the hub and basket while installed on the bike. If there’s any indication of wear pull them and check to see if they are in spec with the manufacture recommended wear limits. The micrometer used to measure the pressure plate and fiber thickness on the clutch plates is also used for measuring the hub. Mechanic’s Tip: Pressure plate wear, broken fibers plates or warped steel plates are also indication of clutch basket and hub wear. 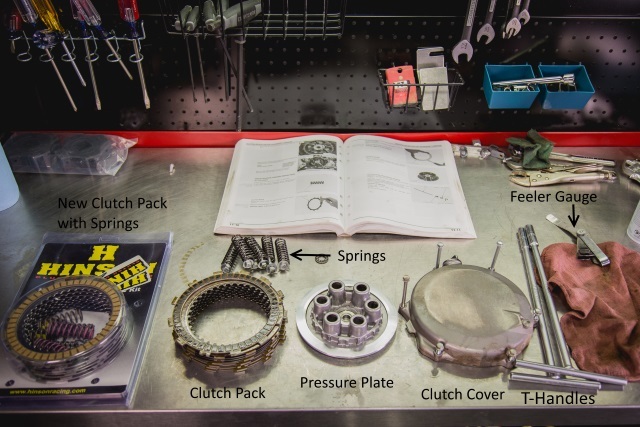 Though changing the clutch pack isn’t an arduous process finding out it is necessary during pre-race practice at the track can throw some unnecessary complications your way. If you don’t have a spare clutch pack, for example, good luck grabbing the holeshot. Otherwise you’ve got to get back to the pits and get to work?real fast. Eliminate this hassle by incorporating a regular clutch check into your maintenance schedule. You don’t need to do this every time since the clutch lasts a number of rides and veteran riders usually know when it’s getting close. It’s simple and takes just a few minutes to unlock the clutch cover, pull out the clutch pack, do a quick measure and pop back into place if they exceed the factory specified limits. If you find the clutch needs replacing, you’ve saved yourself time and a big headache. (1) Material. Pro-Pegs titanium footpegs are manufactured with high-grade titanium, known within the aerospace industry as Ti-6AL-4V. This titanium is lightweight, incredibly strong and corrosion-resistant. It can also be heat-treatable. The material has a composition of 6-percent aluminum, 4-percent vanadium, and slight traces of iron and oxygen. The remaining substance is titanium. Each piece of the footpeg, from the bracket to the cross-section to the outer platform, is TIG-welded together. As a result, the Pro-Pegs have a factory look with impressive strength characteristics. (2) Weight. 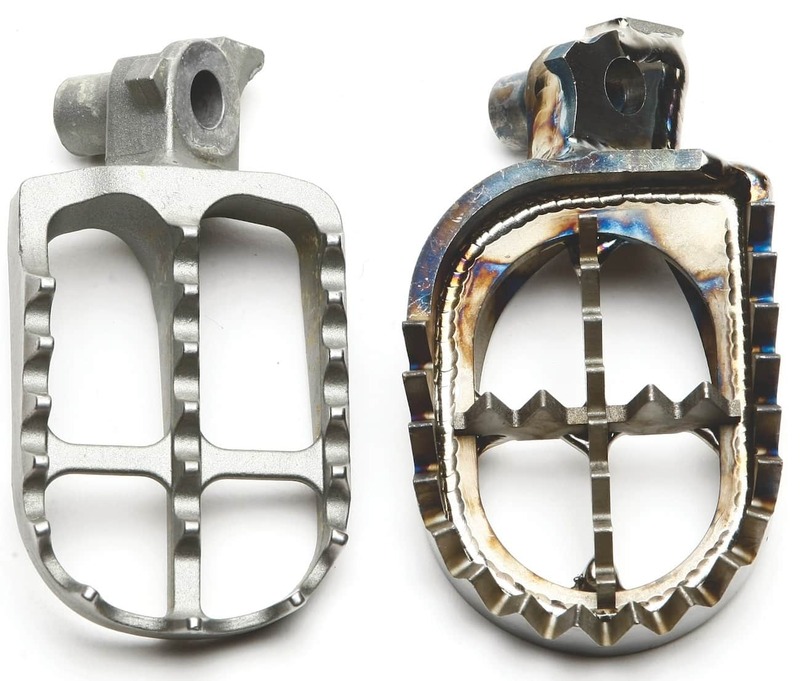 Footpegs that come on production motorcycles are most often made of cast stainless steel, a durable and strong material that is inexpensive to produce; however, it is heavy compared to titanium. Stock pegs are generally over-engineered to ensure that failures (generally caused by impact or stress) don’t occur. There’s nothing wrong with making a footpeg that is bombproof, but Pro-Pegs trimmed excess material to lessen weight and still maintain structural integrity. As a result, a Pro-Pegs footpeg for a Yamaha YZ125 weighs only 6 ounces. A stock footpeg is 8.4 ounces, or 28.57 percent heavier (shown above). The weight savings won’t be as noticeable if swapping stock titanium footpegs (i.e., Yamaha’s line of four-stroke pegs) for the Pro-Pegs. (3) Width. The platform width of a standard footpeg has changed dramatically since the early days of motocross. It’s not uncommon for a stock footpeg to measure over 50mm wide. A larger platform aids in stability while riding and helps distribute the forces that are sustained in a heavy impact. A stock YZ125 footpeg measures 55mm at the widest point and has 20 individual teeth, while the Pro-Pegs titanium footpeg spans 60mm and has 29 teeth. 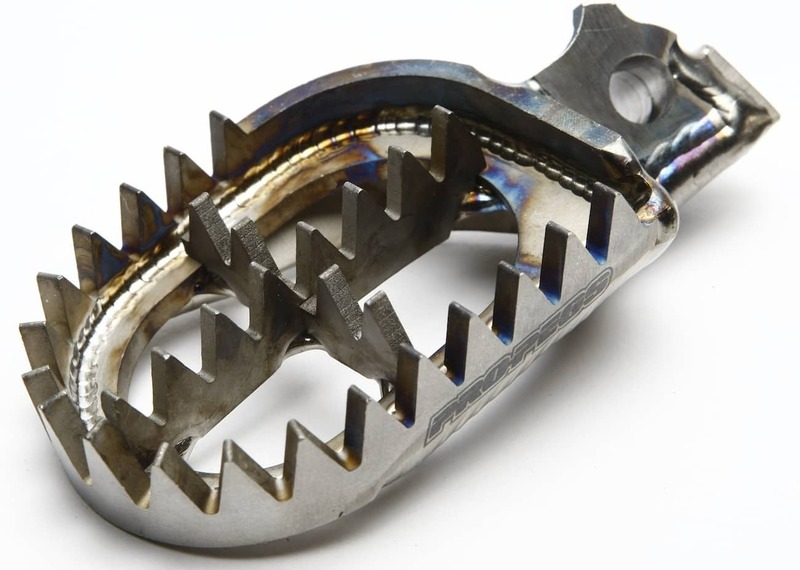 The grooves in the Pro-Pegs teeth are also twice as deep as those in the stock YZ125 pegs. (4) Price. At $268.00 a pair, the Pro-Pegs aren’t cheap. Then again, neither are any other aftermarket titanium footpegs. To compare, British-built Raptor titanium footpegs are $314.95, Works Connection Superlite titanium footpegs are $219.95, and Scar titanium footpegs retail for $343.06. (5) Installation. Pro-Pegs includes two new cotter pins with every kit. This is a good selling point, because it’s not smart to reuse the old cotter pins. Do yourself a favor and use the included cotter pins during installation. As for swapping out the footpegs, it didn’t take more than a few minutes to install the Pro-Pegs. Note that the Pro-Pegs use the standard springs. (6) Performance. Even the most sensitive testers didn’t notice the weight savings, but every test rider was pleased with how much grip the Pro-Pegs provided. Better yet, the pegs remained sharp after months of riding. The wide, 60mm platforms gave us the confidence to blast through treacherous sections of track or flat land from big jumps (it happens) without the arches of our feet getting wrapped up like pretzels. The Pro-Pegs have the distinction of being large without being chunky. WHAT’S THE SQUAWK? The support brackets underneath the footpegs are scooped. Some testers noticed trapped dirt in these areas.